Mahrioara - 2 lumi intre 2 fumuri: Good or Bad? IS MARIJUANA GOOD OR EVIL? REDLANDS - Marijuana might be good medicine. It was a staple crop of our forefathers, and "thousands" of products are made from hemp, from the sails of the first boats ever built to modern-day dynamite, according to editor-in-chief of High Times magazine Steve Hagar, a former writer for the New York Daily News. On the other hand, the majority of Americans don't agree that marijuana should be legalized, including a Bob Stutman,a former Drug Enforcement Agency agent who debated with Hagar on the issue Tuesday night at the University of Redlands' Orton Center. The event, moderated by government department chairman Ed Wingenbach, drew a large crowd, most of who seemed to cheer on Hagar's many jabs during the "Heads vs. Feds" convocation. Hagar, sporting a denim jacket and dark jeans, began the debate, expanding upon five points he felt were important for his side. "It's good medicine. 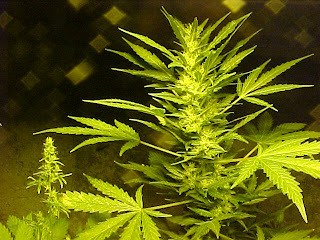 It's been used for everything from epilepsy and multiple sclerosis to AIDS," Hagar started off. "I could keep going and going, because there are so many more disorders and diseases. I didn't say it will cure them. But I know people who can walk today and who are alive today because they used marijuana as a medicine." Hagar berated America's "for-profit-based healthcare system," pharmaceutical companies and insurance agencies for handing out synthetic, mind-altering chemicals to people, many younger than 2, and suggested that pharmaceutical companies and their allies shy away from marijuana because which would make it difficult for them to rely on it as a source of reliable income. "From Maine to Florida, from Texas to Alaska, marijuana will outgrow any plant in the world," which would be counterproductive to the companies that run the controlled drug industry, he said. "Hemp is good for the environment," Hagar said, inferring that four times the amount of hemp could be grown on one acre than an acre of trees within a 20-year span to produce paper, for instance. "The books in your library will disintegrate in your lifetime, yet the Gutenberg Bible is still around. Why? Because it was printed on hemp paper," he said. Breaking off on a tangent, he claimed that George Washington and Thomas Jefferson both grew hemp, and that "all the soldiers who fought at Valley Forge wore uniforms made from hemp. I bet they never taught you that in high school, eh?" He also claimed that Congress outlawed marijuana for "racial" reasons, claiming that black people used it to seduce white women. Another reason Hagar wants to legalize marijuana "has to do with the fact that we have the largest prison complexes in the world," he said, chastising what he felt was a ridiculous system that puts many drug users in prison. "We also need to stop funding corruption," Hagar said, claiming that $500 billion "buys a lot of dirty cops" in the illegal drug trade. Hagar said that "the real price of marijuana - if it's legal - is $1 a pound, and is cheaper to produce than soybeans or wheat; yet it sells for $5,000 a pound. This will never end 'til we stop funding criminal cartels." Hagar's final reason for wanting a change in marijuana's legal status is because "it's part of my culture." Hagar, who was once a routine Lutheran church-goer, explained that marijuana had spiritual components that were the basis for religious experiences within his circles, and related his experiences attending the first Woodstock back when he was completely broke, only to find a culture where everyone shared everything. Stutman, former head of the Drug Enforcement Agency's New York City division, wore a red-and-white pin-striped dress shirt and dark dress pants. He accused Hagar of presenting "opinion and innuendo as fact," and offered his own set of facts. He reminded his opponent that Tamoxifin ( used in breast cancer treatment ) and penicillin are both naturally based products that pharmaceutical companies manufacture. He pointed out that if marijuana became a legally controlled substance, it would have the same controls as alcohol and other products: it's illegal, for instance, to produce alcohol-based "moonshine," and Stutman doubted that anyone would be found producing their own penicillin. "Politically, 72 percent of Americans will say we don't need another recreational drug legalized," Stutman said. "Just because it's natural doesn't make it good. We do a lot of stupid things on this issue," and in agreement with Hagar, said "I don't think people should be thrown in prison for using any kind of drug." He chastised Hagar's suggestion of letting American voters determine that marijuana's legalization could be a good thing - though he also noted that "the day the majority of Americans want marijuana legalized, I'll be all for it." Stutman suggested a scenario in which a doctor could recommend Tetracyclin or penicillin for a medical condition, only to have the doctor say, "Why don't you put it up for people to vote on to determine which is best for you?" Stutman said that Canada legalized hemp eight years ago, but a lot of hemp farmers there went bankrupt "because no one bought the damned stuff." "If it's as great as Steve says it is, why isn't everyone wearing hemp clothes?" particularly in Europe where it's more widely accepted. "My guess is that it's not as feasible as he says it is." Stutman poked fun at Hagar's declaration about hemp being part of his "culture," and pointed out that Americans didn't approve the early incorporation of polygamy within the Church of Jesus Christ of Latter-day Saints. "Just because it's done in the name of religion doesn't mean you can do it," Stutman said. Stutman also claimed that Hagar left out disclaimers that marijuana causes "physical dependence, and interferes with the ability to think and reason." Stutman suspects that early marijuana use years ago lead his sister to eventually succumb to lung cancer at the age of 44. Stutman attacked Hagar's suggestion that smoking medical marijuana was beneficial. "First, I think smoking anything is a bad idea," Stutman said. "I also think it's stupid to suggest that, in order to obtain the two chemicals in marijuana that are known to be beneficial, you have to take in the 433 other chemicals that aren't." The debate concluded with closing statements and questions from the audience. Hagar did not agree that "anything that causes dependence" should be outlawed. "We'd have to outlaw eating junk food; we'd have to outlaw watching TV or making love," Hagar said. "We may as well make everything that causes dependence illegal." Hagar agreed that smoking anything "is bad for you," and described other ways to ingest it, via "putting it in tea, or brownies, or vaporizers." Hagar accused Stutman of marijuana even though "I know he's never tried it" ( the one time during the debate that an otherwise stern Stutman broke into a huge grin ) and extended an all-expenses-paid trip to participate in the Cannabis Cup Nov. 18 to 22 in Amsterdam, Netherlands, suggested bringing his wife, alluding to Hagar's earlier comments that people who are high have a more enhanced sexual experience. Stutman politely declined, expressing his disinterest in "being with a bunch of 55-year-old hippies who can't get it up without smoking a joint." He then responded to Hagar's jab about debating the detriment of smoking marijuana without having tried it, saying, "We should probably have the state ban all neurosurgeons who haven't had their brains operated on." Danielle Zimmerman, a junior entrepreneurship and art major from Jamesville, Calif., felt that Hagar more articulately related his points to the mostly university audience. "Steve killed it. He had the whole thing going for him, and was the stronger debater," she said. Tim Bolin, a junior philosophy and sociology major from La Quinta, agreed. "A lot of what the other guy said wasn't really relevant. Steve's style was more likeable and less confrontational," Bolin said. Tristan Murray, a student at Riverside Community College studying European history, said, "The editor of High Times had the better argument." Aaron Bergman, a freshman music major from Vashon Island, Wash., decided that the debate hadn't changed his mind that marijuana should be legalized. "Nothing's changed my opinion. Both were good presenters, and at times one or the other had the stronger argument on different things, but they both did well," he said. Brett Aho, a sophomore French, German and international relations major from Bremerton, Wash., had a bias going into the debate. Aho, who is in the process of starting a chapter of Students for Sensible Drug Policy at the university, was one of several students who asked questions during the question-and-answer session. "I guess I'm a little biased," he admitted, "but as I listened to the debate, I liked Steve's perspective, and his argument was more eloquent. The other guy responded by working his way around the questions. But in the end I did feel there were balanced arguments on both sides." Harry Kurland, a senior business major from Palo Alto, felt that Stutman had the clearer head in the debate. "The DEA guy had a strong argument, because the marijuana guy was just presenting opinions, like, 'It's good for thousands of diseases,' but never cited any medical reports," Kurland said. "Also, he never brought up the negative aspects as to why it could be illegal, like with the dependency issues and the diminished motor skills. He ( Hagar ) had the cooler debate, but what he said didn't make it right."